God's salvation is not earned by our merits, good deeds, attendance at church, personal morality or anything of human origin. These are all important fruits of the new creation in Christ by God's initiative valid only as relationship. The question then is that if Christianity is about having a personal relationship with God, how then do we enter into that relationship? The answer there can be found our personal response to the good news of Jesus Christ as encapsulated in the Gospel, but what is the Gospel anyway? Translated from the original language it means 'good news'. Good news? Good news about what? It is the good news of God's love manifested in Jesus Christ. It is about Jesus Christ and His deity and humanity. It is about God's act of reconciling the world to Himself through Christ's life, death and resurrection. First is the fundamental truth that we are all sinners and that sin separates the human race from God. Sin is our deeply rooted tendency to selfishness which taints even our best intentions and implicates us all in the web of human evil. In sin we turn our backs to God and find ourselves on the well frequented highway that leads us ever further from God. In our consciousness of sin we know that God the absolute God must oppose and condemn our evil. As sinners we are the godless – in the real sense of that word: alienated from God. Finally there is death. Death may be seen as the end to which our culpable failure in life must lead. Death may also be seen as the final surd which threatens everything else in life with meaninglessness. But the Bible says that it doesn't end in death, being sinners we are therefore accountable to answer back to God for our sins. The passage speaks about a postmortem judgment that will determine our eternal destiny. This is the ultimate human predicament we all face. Christianity deals with human sin and how to get rid of it. Only those who admit that they share in the problem of all humanity are eligible for God's redemptive love in Jesus Christ. Sin is the problem; God's grace in Christ is the answer. Jesus lived a life of loving identification with others, in all sorts of conditions of human life. In other words, He practiced the kind of love which is not mere benevolence, wishing people well from a distance, that that love which enters people's situations and makes their plight sympathetically its own, this was done so in the Incarnation. But it did not end in mere identification with us, in full understanding of our situation Christ took up God's judgment on our behalf. He died the kind of death which symbolized God's verdict on sinful humanity: condemned to death. He did so in consequence of the loving choice of identifying with others which He made in His life and sustained in His death. He died our death, sharing our failure, condemnation, despair and godforsakeness. For the crucified Jesus was not just one more godless, godforsaken human being, dying as all of us must He was the man who chose to identify Himself in love with the godless and godforsaken. It was His mission from God to do this. As the one who came from God, the Incarnate Son of God, it was God's love He expressed and enacted in His identification with humanity by entering human history. Therefore the crucified Jesus brings the love of God into the depths. God's work of reconciling the world to Himself, the good news of salvation from the power of sin and death accomplished and made known in His word. Only because He died can His resurrection also be ours. Because Jesus died our death, identified with us in death, God's love reaches even the dead and raises them to new life. Because Jesus died our death, death need not be the fate it otherwise is. The light of Jesus' resurrection dispels the shadow death casts over life. All this available to us in Christ alone. The importance of all this is encapsulated in the word 'grace'. It means God's unmerited favor for us, regardless of who we are ad what we have done. God by actualizing His love for us in Christ therefore invites us to partake of this grace by responding to the Gospel on the basis of what God has done in Christ. If our human dilemma is sin, we need to be sure we understand what sin is. A modern definition of sin is: “anything which we think, believe or do that is less than God's best intention for us.” Thus, sin can be right things left unthought or undone; sin can be bad things thought or done. Sin is our mismatch with God's perfect expectation for His human children. Sin can involve attitude as well as action, hear as well as hand. The first step towards becoming a Christian is to face the fact that each one of us is a sinner in the eyes of God, needing His redemption, correction and salvation. God has taken the initiative through His love in sending His Son Jesus to take upon Himself all the penalty due us for our sin. For the broken relationship between God and humankind to be reknit, God has taken the first step. Our first step is admitting that we have erred, sinned, failed, fallen short of His expectation or glory. Such an admission requires repentance. To repent in Greek means “to change one's mind” or “to alter one's direction” or “to turn around and go another way”. Repenting from our sin is the first step in entering into right relationship with God. But in a sense repentance is a negative; it is doing something about the obstacle between God and us. The second essential step in becoming a Christian is a positive, believing that God has already a provided a bridge between humankind and God in the Cross of Jesus Christ! We are called to believe in Jesus Christ as our personal Savior and Lord. There is something weak in our usage of the English word believe, while the Greek word translated believe is always much stronger. In English believe may indicate simple “an inclination to agree,” “to acknowledge that something may be true.” It sometimes is a “cheap word.” Not so in Greek, for in Greek the verb believe always takes a different preposition than we use in English. In English we say “I believe in”; in Greek the language says “I believe into.” There is commitment; indeed, often a commitment of life! To accept means to personally appropriate Him as our own personal Savior and Lord and not just the theoretical Savior and Lord of “the world” or of “somebody else.” There are 3 things that a person must do to “appropriate” God's gift: (1) take it, accept it, “accept” as it, really meant for me; (2) thanks God for it; and (3) open the gift and put my personal acceptance mark on it. Another way at looking at it is basically to sum it up in a single word: faith which is basically the only apt response. To respond in faith means to identify ourselves with Christ who identified Himself with us. In faith, we respond to the God who has already grasped us, and we discover that the reality of God is the meaning of our lives. Faith occurs as my whole self responds to the reality of God. Faith is thus the total transformation of my existence. God addresses me; God confronts me; God calls me; God summons me into fellowship. God becomes more real to me than I am to myself, so that my whole existence is placed in a new context – in the context of God! Have you already “repented, believed into, and accepted” God's way of salvation? Are you now ready, perhaps for the first time, to “repented, believed into, and accept” God at his word? Simply said a Christian is a person whose life is lived in relationship with God through Jesus Christ, and in common with other Christians in the church seeking to deepen that relationship and to follow the way that Jesus taught. Oasis: What’s The Story Morning Glory? 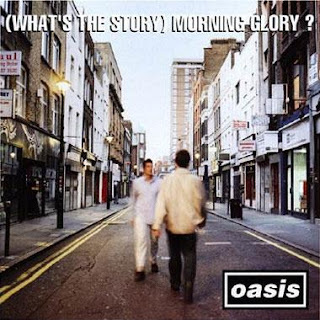 I remember getting the knack to buy this record because I was able to watch the video of Wonderwall, on the now defunct Citynet 27's sporadic broadcasts of music videos from Channel V.